This is a pewter bowl full of ambrosia apples. 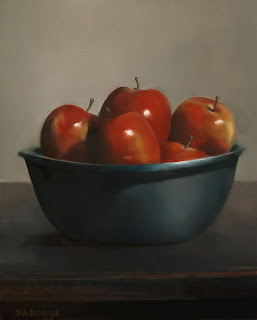 I really liked the red of the apples inside the gray of the pewter bowl. They are sitting on an old walnut table from my mother in law's estate. The table is old and and has lost some of its finish which creates these bluish tones in the shadow areas when it is under light which I found interesting. I hope that you enjoy the painting!